Being a webmaster, you want to keep tabs on your website at all time. If something goes down, you want to be able to fix the problem or alert those that can. You also want to keep tabs on your hosting. If they’re promising 99.9% uptime, you want to make sure that’s happening and you’re getting what you pay for. A website monitor can help with that, but most of the ones I have seen so far have had quite a cost attached to them that kept them out of the reach of a webmaster of a small website like mine. That is, until I found FreeSiteStatus. 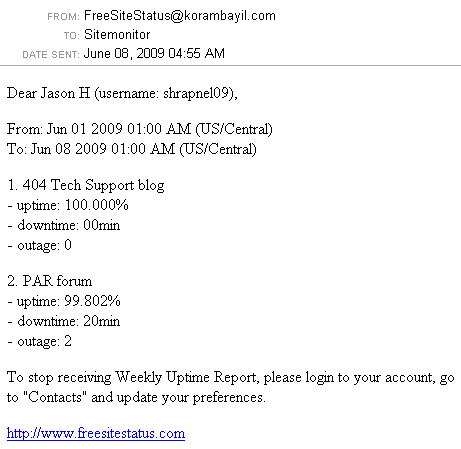 FreeSiteStatus monitors your website and can send you alerts if the server goes down. If FreeSiteStatus can’t connect to your server on port 80, it will mark it as being down and send you an alert if you requested one. When you start FreeSiteStatus, you start with a Pro trial account. This allows 1, 2, 3, 5, 10, 15, 30, 60 minute checking interval. After the trial runs out and you revert to the free version, you are restricted to a website check of only every 60 minutes. The alerts will trigger if the server is inaccessible from the Internet, ping fails, can’t connect to port 80, URL is inaccessible, specific keywords appear on the page, or specific keywords do not appear on the page. FreeSiteStatus monitors your site from multiple locations. If one location notices the site is down, it will pass the request onto another location to confirm from a world wide network, which will reduce your false alarms and confirm that the issue is not on their end. You will receive an e-mail at the first check where the website is down and when it returns to the Up status after a check. You can also purchase credits to send a cell number a text message when the site status changes. You can optionally create a public report so users can confirm whether a site is down or watch the track record of a particular site. You can also opt to receive weekly and monthly compiled reports in your e-mail to tell you the relative uptime of your site. After my trial with FreeSiteStatus ended, I removed my site from their 60 minute check and began looking at 100 Pulse. The site for 100 Pulse is very simple and doesn’t need to be complicated any. It is very straight forward and very easy to configure a site to be monitoring at different intervals: 5, 10, 15, 30 minutes, 1, 3 hours. You can also allow a few failures to pass by if you want somebody else to take care of the problem. You can notify them after the first failure and notify somebody else after two, three, four, or five failures by easily adding multiple contacts. Per site, you can choose Daily, Weekly, or monthly reports. You can also view a report over any time period at anytime from the 100 Pulse website. You can also schedule maintenance so you don’t get any unnecessary alerts when you’ve taken a site down for maintenance. It seems 100 Pulse and the Bad Behavior WordPress plug-in are incompatible. 100 Pulse is in beta currently, so pricing and other features may change. For now, though, I recommend it as the most versatile, highest frequency free site monitoring service. You can see a full list of other carriers at this Wikipedia article: SMS gateway. Look for the E-mail to SMS Gateway column for the e-mail address for a person’s carrier.